"Some say that war is the beginning of civilization. 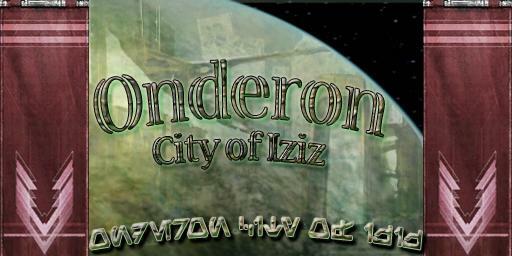 On Onderon, this was certainly the case, though it was a civilization that took a very peculiar form." One of three planets in the Onderon system, Onderon has a temperate climate, and was once home to a primitive race of Humanoids. Battle ground of both the Mandalorian Wars and the Jedi Civil War. Home to what is known as the Beast Riders. The Beast Riders of Onderon were a group of dissidents cast away from Iziz by its rulers who had been corrupted by their former king, the Sith Lord Freedon Nadd. The rulers had hoped the dissidents, branded "criminals," would be devoured by the vicious beasts in the Onderon wilderness that had migrated over an oxygen bridge from the moon of Dxun. However, over time, the outcasts succeeded in taming the beasts, using them as winged war mounts for their campaigns against Iziz. 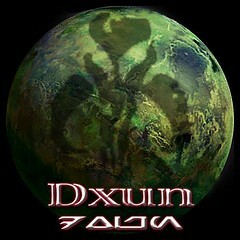 Dxun (pronounced /'dʌksɪn/) was the largest of four moons that orbited the Outer Rim world of Onderon. Like its parent planet, it was covered almost entirely by dense jungles that were populated by many species of fierce, predatory animals. Due to its constant rains and wet climate, mechanical devices did not last long and required continuous maintenance. Moreover, the jungles were inhabited by many dangerous predators such as bomas, cannoks, drexls, maalraas, Skreevs, and zakkegs, forcing the moon's inhabitants to be armed at all times. Though considered a moon of Onderon, Dxun and Onderon are almost sister planets. They are so close to one another that it is only a short shuttle ride between them, and they even share a bit of the same atmosphere. Every year, during Dxun's summer season, the atmospheres of Onderon and Dxun connect. This allowed the vicious Drexls to wander and settle on Onderon, thus laying the foundations for the Beast Wars. After assuming the leadership of the Mandalorians, Mandalore the Ultimate made Dxun his stronghold, from which he planned his attack on the Galactic Republic. Years later, the Republic attempted to capture the Mandalorian headquarters on Dxun. Republic forces managed to defeat the Mandalorians, but the victory came at a heavy cost. During the bloody battle, the Republic lost ten soldiers for every Mandalorian killed. After the battle, the Republic military did not bother to demolish many structures that the Mandalorians had built; nor did they uncover the many hidden weapons caches providently left in case the Mandalorians were someday to return. • The Teleporter in the Landing shuttle has "RP Destinations" such as places you may have logged or left from and you wish to return to those areas as you left off. • Dxun - You must fly to, there are free vehicles available. • On the vendor platform if you walk past the teleporter you can open a bay to rez your own ship and fly wherever. • Apartments are OOC/IC areas depending on the owner of the rent. • There are little IC shop booths anyone is free to use, if you would like to see an example there is a mag stand near the west wall Cantina. • Outside the city wall, if you look above you will see slightly visable cylnders that you can click to change the weather in that area. • The Top 5 Race/rs are set by Xoza Tyron, if you have a record IM him informing him of it, best to take a pic or have a witness for the race. • You must start at the finish line go all the way around the outside of the sim and back to the finish line to track your race correctly and fairly. • Only one racer can do a timed race at a time. • The Skyramp activates best with Onderon Resident tag, internal palace shielded areas are for Palace Personel only.